Sprint has already brought city wide WiFi (called WiMax) online in Baltimore and more cities will be added soon. There will be WiMax enabled laptops as well as USB hardware add-ons that will allow laptops to connect just like mobile broadband services, but the device is the picture above is a handheld device specifically designed for the mobile user in a WiMax area. This could be a nice device for someone on the go with a WiMax connection. The hardware is quite similar to the original N810, with the addition of a small antenna on the back and a slightly different color design. Aside from the extra radio for WiMAX, the internals are the same; the 400MHz TI HS OMAP 2420 CPU, 128MB of DDR RAM, and 256MB of Flash RAM remain unchanged. 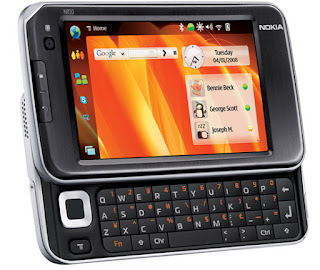 Chris Staley, Nokia VP of sales, told Ars that the WiMAX-enabled N810 will also include some firmware enhancements and an update to the Linux Internet Tablet OS 2008 that includes an improved e-mail client, seamless software update functionality (which will eliminate manual updates), and support for Chinese character rendering in the browser and RSS feeds.